Global demand for cement and concrete additives will rise 7.2 percent annually through 2019 to $24 billion. The Asia/Pacific region will remain the largest market, while the Africa/Mideast region and Central and South America will grow the fastest. Chemicals will remain the largest segment and will lead gains. 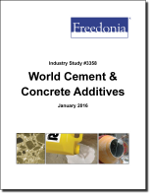 This study analyzes the $17 billion world cement and concrete additive industry. It presents historical demand data (2004, 2009 and 2014) and forecasts (2019 and 2024) by type (chemical additives, mineral additives, fiber additives) and market (e.g., buildings, highways and streets) for six world regions and 21 major countries. The study also considers market environment factors, details industry structure, evaluates company market share, and profiles 35 industry players, including BASF, Sika, and WR Grace.